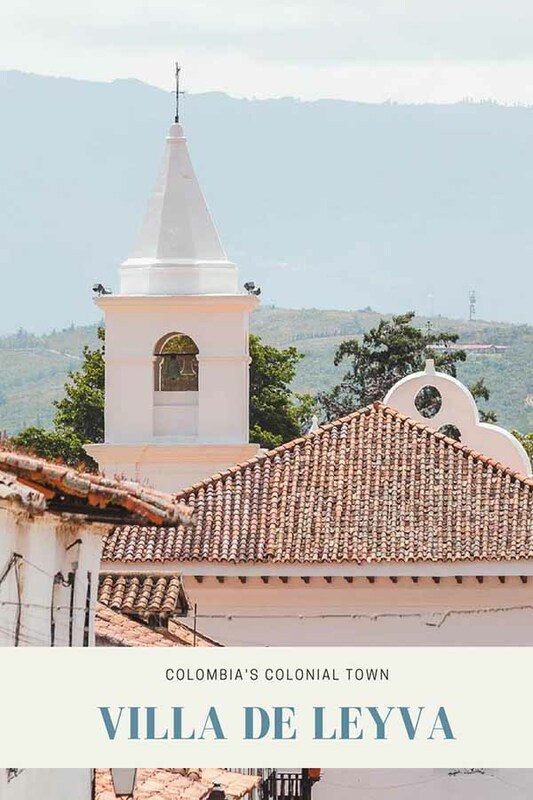 Here is our travel guide to a colonial historical town Villa de Leyva, Colombia, including best things to do, must visit places, how to get there, safety tips and where to stay. One of the most beautiful and well-preserved colonial villages in Colombia, Villa de Leyva, lies only four hours drive from Bogota, and that's why it is a popular travel destination not only for international travelers but also for local weekenders. We are sometimes pessimistic when reading poetic words in guidebooks about villages frozen in time or about places where you step back in time. Nowadays not many places can maintain the real authenticity and keep the feeling from the past, usually only because they are sadly trying to meet tourist's needs. In some ways, we found Villa de Leyva a bit overrated (especially after we visited other colonial villages in Colombia), but it doesn't change the fact that it is worth the visit. The architecture in Villa de Leyva didn't change much from the late 16th century, and that's why the village high in the Andes Mountains is so high-rated among travelers. Villa de Leyva is off the main roads, and probably this is one of the reasons why it has undergone only a little development in the past 400 years. We've heard that Villa de Leyva is a perfect getaway for Bogotans, who take the village by storm especially on weekends. We didn't want to arrive from Bogota to another crowded place although on a smaller scale, so we smartly planned our arrival on Monday in the afternoon. It would have been a perfect plan if it hadn't been the last day of an every year festival honoring Virgin del Carmen. The square was full of stalls, jumping castles, loud concerts, and fireworks. As we arrived late, we could've comforted ourselves that it's the last day of celebration (the information we quickly googled) and the square will be dead the day after, but what we didn't know then was, that Colombians continue the celebration even after the official end (not only a day but two! ), and we won't get the most featured photo of EMPTY square. But anyway, we enjoyed our time here, but if you're looking to get a calm or romantic experience, always check local festivities or holidays as well. Villa de Leyva doesn't only boast colonial buildings and stone streets, the settings, deep in the surrounding hills altogether with moody clouds rolling over later in the afternoon create the genius loci and amazing atmosphere. Thanks to its surroundings the village is also an excellent place for those in love with nature, and if you like being more active, you can freely cycle around. Colombian government works hard to promote cycling as a healthy and modern way how to transport, and it seems that Colombians took an initiative and became passionate bike lovers. We shouldn't also forget to mention that if you are looking for a safe destination in Colombia, Villa de Leyva it is. As usual, use your common sense. If you are still worried about traveling to Colombia and South America in general, read our in-depth post Is It Safe To Travel To South America? which includes useful tips and advice on how to stay safe. It is simple to walk through Villa de Leyva on own. The village is conveniently small, so there's no chance you could get lost. We loved the freedom of walking around without having a set plan of what to see. We just followed our sense, and the streets always took us somewhere nice. Whether you want to or not, there are places you can't, and you won't miss because eventually, the streets will take you there. Plaza Mayor is the famous square (and one of the few in Colombia not named after Simon Bolivar), one of the largest in South America. It is the liveliest place in the whole village and unquestionably a spot to admire. The square is surrounded by colonial buildings, the south-east side features the Iglesia Parroquial and in the middle of the square stands Mudejar fountain. Another church Iglesia del Carmen and Parque Antonio Ricaurte are places you should not skip by no means. Villa de Leyva lies in Boyaca department, where many archeological sites and fossil discoveries have been made. In El Fosil museum, you can find 120 million-years-old kronosaurus skeleton. The fossil of a prehistoric marine reptile is 7 meters long and what's interesting, the specimen here in Villa de Leyva, is the world's most complete. Apart from the Kronosaurus, you can also see a display of other smaller species found in the area. The entrance fee is 7 000 COP, everything is in Spanish only, but there is not much to read. The museum is 6 km from the village. About 13 km from Villa de Leyva, the quiet monastery from 1620 represents a nice break from sometimes too loud Colombian style. The monastery features a beautiful courtyard with a well in the middle and notable chapel. Have a closer look on floors and walls as they contain fossils because the material comes from the nearby fossil-rich area. The entrance fee is 5 000 COP and signs are also in English and French as well. The Muisca tribe belongs to one of the oldest indigenous groups in Colombia. They built monoliths into the ground in a repetitive pattern, and by measuring the shadows, they were able to predict the best planting seasons for their crop. The El Infiernito site lies only 8 km from Villa de Leyva, and it is the place where you can see the original site of Muiscas. The entrance fee is 8 000 COP per person. All three sites outside Villa de Leyva can be visited on the bike, or by car. We opted for the latter and took a cab. To see El Fosil, Convento Del Santo Ecce Hommo, and El Infiernito reserve three to four hours. First, go to a bus terminal which is very close to the center and there are always a few yellow taxis waiting. We paid 60 000 COP without bargaining as we don't speak Spanish. To be honest, we just wrote on the paper names of all three sites we wanted to see, the total price and it worked out. Always check opening hours by yourself. Some sites close on Mondays, or they have a lunch break for a few hours and drivers would probably take you there anyway. Around 2 km from the center of Villa de Leyva are Pozos Azules, five small differently colored lakes. You can walk on own from the village and behind the shopping mall, when the pavement ends, take a shortcut through the dirt road on your right. This road will take you to Pozos Azules entrance, and you don't have to share the roadway with cars. You can find information online about swimming in lakes, but according to signs in the area, swimming is prohibited. The entrance fee is 10 000 COP per person, but in our case, the cashbox was closed. The most visitors are coming from Bogota, and so we did. You can buy a ticket in advance on Redbus website or directly at the terminal. A direct bus goes twice a day from Terminal de Salida, one early in the morning and the other one around midday. You can also wait for the bus at Terminal del Norte, but if you haven't booked in advance, there is no guarantee that seats will be available because this bus is coming from Terminal del Salida. Omega bus company operates this service, and it takes 4 hours to get to Villa de Leyva. Several buses per day run from Bogota to Tunja, the capital city of Boyaca department and from Tunja, it is easy to switch to a bus to Villa de Leyva. You will find plenty of accommodation in Villa de Leyva. Nowadays, many original buildings became hotels with lovely courtyards, and we highly recommend you to stay in a traditional house to soak in the colonial atmosphere. Budget | Hostal Everest - Budget-friendly accommodation features clean rooms and great facilities. Breakfast is included. Mid-range | Villa Gaddiel - Centrally located hotel in an old colonial building. This is the place that we stayed in. Luxury | Hotel Antonio Nariño - Hotel is set in the beautiful building from the colonial-era, offers very clean rooms, and beautiful courtyards. Colombian cuisine is not the healthiest and reasonable diet friendly. Almost all meals are deep fried, heavy and in the beginning, we were desperate to find something "normal" to eat. Fortunately, in Villa de Leyva, we found a real gem, restaurant La Tienda de Teresa. They are famous for breakfast and lunch which can sell out before 2 PM. The food is tasty and the price very cheap. We had menu del dia (lunch menu) for only 10 000 COP each and it consisted of soup, chicken with rice and salad, juice and dessert. Restaurant opening times in Villa de Leyva vary a lot so don't rely on information online too much. There is also a small grocery store with good prices where we usually bought some yogurts, buns and most importantly avocados. A shop with fresh fruits and vegetables is just across the street. Villa de Leyva is definitely one of the most interesting places in the country, and if you like peaceful colonial towns, you should include it in your Colombia itinerary.